Welcome to one of the most innovatiove ways to communicate and share data! 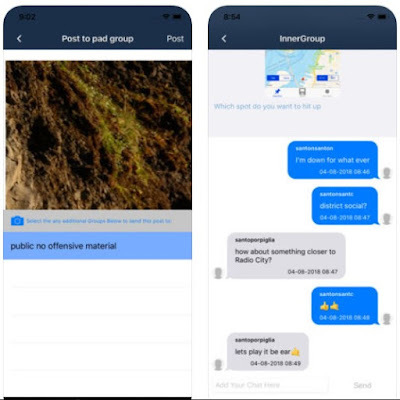 InnerGroup is a revolutionary cross-platform app for users to send end-to-end encrypted text, video, picture messenger with full sender control. And it’s totally free! With intuitive user interface and tons of unique and useful features, we pronounce it a Messaging App of the Month. We have been using InnerGroup in our network of websites and now it is the main communication tool. Why? Because it cross-platform, safe and it has all the features anyone may need in communication, including: sharing of photos, audio, notes, documents. The purpose of the app is group communication. Users start or join a tight-knit group that is comprised exclusively of members – who are called “Groupies”. Only people (a.k.a. Groupies) who are invited can join a group. Our group on HighTechHolic is only consisted from our writers. Thus, you can use InnerGroup for work and personal use as well! What InnerGroup gave us, and hopefully will give to any other user is the sense of control. You can do so much with the messaging. The great thing is that users can send secure, end-to-end encrypted texts, videos, picture messages, and audio. Nothing is kept on the cloud so there are basically no ways of anyone hacking into your privacy. Additionally, it is great that conversations and posts can’t be tracked, intercepted or monitored. And one of the greatest feature is that If a group’s owner decides to delete a group, then all posts are automatically deleted from each Groupie’s device. So, InnerGroup is practically a feature-rich messaging app that gives you amazing sense of control! It's secure and you can do anything with it in terms of sharing messages and other types of media! Get it on the links bellow for any platform you want to use it on.